Dedicated to bringing Michigan made beers to Charlevoix, Phil Parr, owner of Bridge Street Tap Room in Charlevoix, knows his stuff. With a mission to have a large variety of beers that pair perfectly with pub food like grilled mac and cheese (you heard right) and Coney-style hot dogs, Bridge Street Tap Room is bringing a taste of something different to the Northern Michigan food scene. You’ll be sure to find a beer you love at this Northern Michigan restaurant with 32 taps on line. Yes, 32 of them. And don’t be afraid to sample with 4-, 8-, and 16-ounce pours available. MyNorth’s Kelly Brown spoke with owner and general manager Phil Parr of Bridge Street Tap Room in Charlevoix to see what’s up with this tucked-away tap room. What is the idea behind Bridge Street Tap Room in Charlevoix? Well, the idea was conceptualized by myself and my business partner Aaron Hagen, over the past few years. We kind of really wanted to bring something different to the table in Charlevoix. The other restaurants have been here a long time and we wanted to bring variety, because it leads to growth. With the boom of craft beer within the last two years, and increased market shares in restaurants we really felt like starting up a tap room in Charlevoix. When we started looking for locations in January we were really passionate about Charlevoix because it’s a place that people love and come to. We wanted to focus on Michigan. 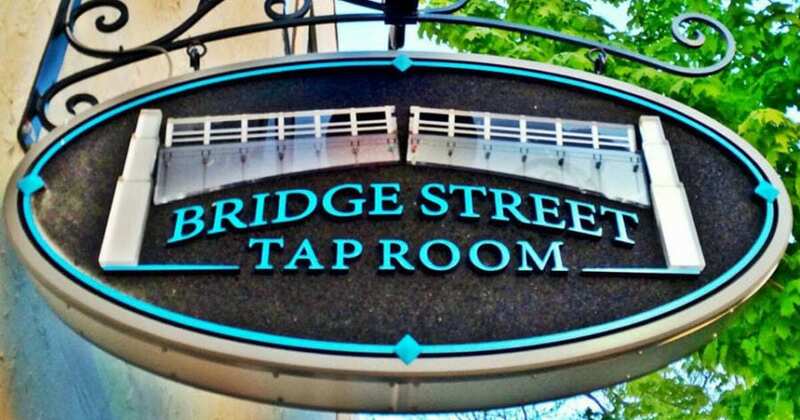 The Bridge Street Tap Room in Charlevoix officially opens on June 19th. What are you expecting? Our Grand Opening is on Thursday. We got our liquor license on Friday [June 13th], so we’ve been having some soft openings. We opened at 5:30 on Friday and had over 600 guests between Friday and Saturday. We were just welcomed with great support from the community. The Grand Opening on Thursday will have all 32 taps on line and our food menu will be complete. It’s really the kick-off. We will be open 11 am to 11 pm. With 600 guests how do you begin to decide which beers to meet everyone’s individual tastes? The biggest thing is that you have to find balance with 32 taps. We’ve taken a lot of time to visit different breweries around the state and really seek out these unique beers. Joe Short and Jon Wojtowicz have been very supportive of our idea, and have kind of helped us along. We bounce ideas off of them, and they’ve helped with signage and making sure we have the proper lingo with our beers. So we’ll be featuring a good portion of their beers like Alien Einstein, which isn’t even available at Short’s. We’re getting an exclusive cider from Verterra. Besides that, we’re going to have rotating taps with beers from all over Michigan, like Greenbush and Brewery Vivant. We’ll have the familiars, too, like Bell’s Oberon and Short’s Local Light. People are trying stuff because the name sounds cool and with 4-ounce, 9-ounce, and 16-ounce pours, they don’t have to commit to a pint. We want to act like a brewery, without actually being a brewery. We’ll also have wine and spirits on hand. Pub Grub—What’s the inspiration and idea behind that? Being craft beer, you want to have a lot of food that pairs with it. Pizzas, hot sandwiches, share plates…just stuff that really pairs well with beer. And we’re going to be using a lot of Michigan-made products like cheeses, meats, fresh veggies, etc. Guests can come in and have a few beers and a pizza, and they’re not going to break the bank. Our menu is small, but we’re designed to get food to the table in ten minutes, anytime of year. With all this talk of food, what would you suggest as far as a dish and beer go for the summer? The standards are always good, but what’s really great about what we’re going to have is this Kuhnhenn Drippa IPA. When people think IPA they think a lot of hops, and it does have a fair amount of hops in it, but what’s great about it is it’s very smooth and food-friendly. I would recommend pairing that with the Cajun turkey sandwich, which is made on Stone House artisan bread with smoke provolone cheese and Charlevoix-made Mike’s Mustard. It’s got a lot of flavor in both the beer and food. But everything on our menu goes together.